The 8 Principles of Goals and S.U.C.C.E.S.S. - What Does Success Mean to You? 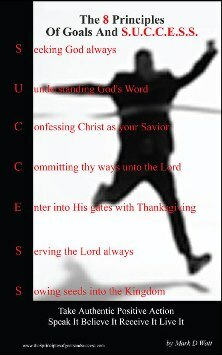 The 8 Principles of Goals and S.U.C.C.E.S.S. will leave you in no doubt how to determine what you want, how to set the goals to get what you want, and how to gain the ultimate success. April 15, 2010 - PRLog -- What do you want to accomplish in your lifetime? Do you want material success? Happiness? Children to carry on your legacy? A closer relationship to God? How do you define success? S is for Seeking God always. U is for Understanding God’s word. C is for Confessing Christ as your savior. E is for Enter into his gates with thanksgiving. S is for Serving the Lord always. S is for Sowing seeds into the kingdom. In a world full of self-help books and personal growth memoirs, this is the book that answers the tough questions. It takes the position that the answer for true success comes from only one book: the Bible. About the Author: Mark D. Watt is an author and entrepreneur. The 8 Principles of Goals and S.U.C.C.E.S.S. was inspired by his study of the Bible, and was written in the hope that his philosophies may spread the truth about goals and success to the world. He lives in Raleigh, N.C., and is working on his next book. Strategic Book Group specializes in promoting the works of new and previously undiscovered writers. We make books available to bookstores and Internet distributors throughout the United States and Europe. SBG is aggressively seeking new talent.